On the occasion of the consideration of State party’s reports of Japan by the UN Committee on the Elimination of Discrimination against Women (CEDAW), indigenous Ainu, Buraku and Zainichi Korean women submitted the report to the Committee in the aim to include their issues in the discussion. Japan will be reviewed by the CEDAW Committee on 16th February during its 63rd session. For further information, visit the CEDAW webpage. The public discussion between Japan and CEDAW Committee will be webcasted live at the UN Treaty Body Webcast page. 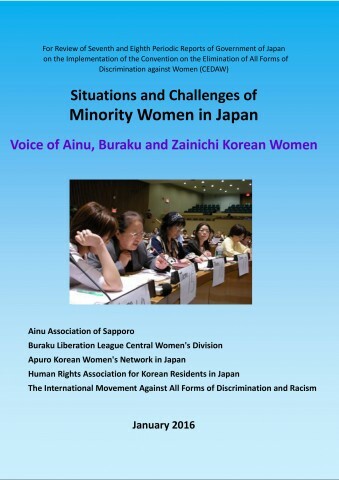 To read the report “Situations and Challenges of Minority Women in Japan”, click the image below.